Chrissy Teigen Gets Handsy With John Legend Before Hosting Billboard Music Awards: "He Was Touching My Breasts!" Chrissy Teigen may be hosting one of music's biggest awards show. But instead of freaking out about what could go wrong, the supermodel decided to focus on far more important things. It's all about the beauty routine, obviously. "I got a spray tan the other night, which is on my palms," she revealed to E! News on the 2015 Billboard Music Awards red carpet. "It matches John's hands as well because he was touching my breasts apparently in the middle of the night." So much for the saying what happens in Vegas, stays in Vegas. "That's what happens when married couples sleep together," John Legend added with a smile on his face. 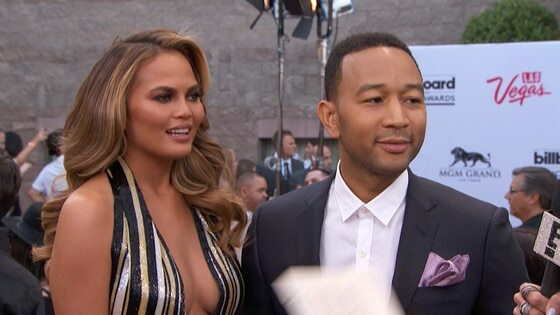 Why Could Chrissy Teigen Flub Hosting the 2015 BBMAs? A nice tan sure is nice to have when one steps onstage in front of millions of people. Chrissy realized, however, that she also has to have a pretty good vision when she hosts the three-hour show with Ludacris. "Honestly, I'm blind as a bat so acuvue came to my hotel, gave me contact lenses and I'm still getting used to them," she admitted to Giuliana Rancic. "If I flub, just blame my vision." Whatever happens Sunday night, John will be there to support his wife. Besides, Chrissy swears she can handle it. "I have a lot to read," she joked. "I have to slow down but for the most part, I think I'm pretty okay." For more from the 2015 Billboard Music Awards, watch E! News Monday at 7 and 11 p.m.